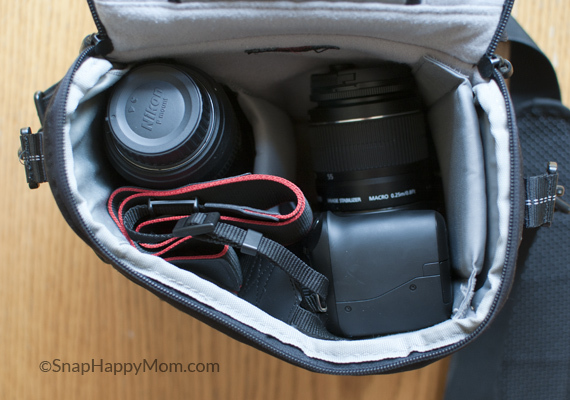 Many camera bags today come with customizable interiors. These usually consist of padding pieces with velcro tabs that you can attach in lots of different ways inside your bag. Really, there are lots of different ways that can work for you and your particular gear. However, there is one way that I really encourage my readers to avoid, and that is any position where the camera lens is pointing down. 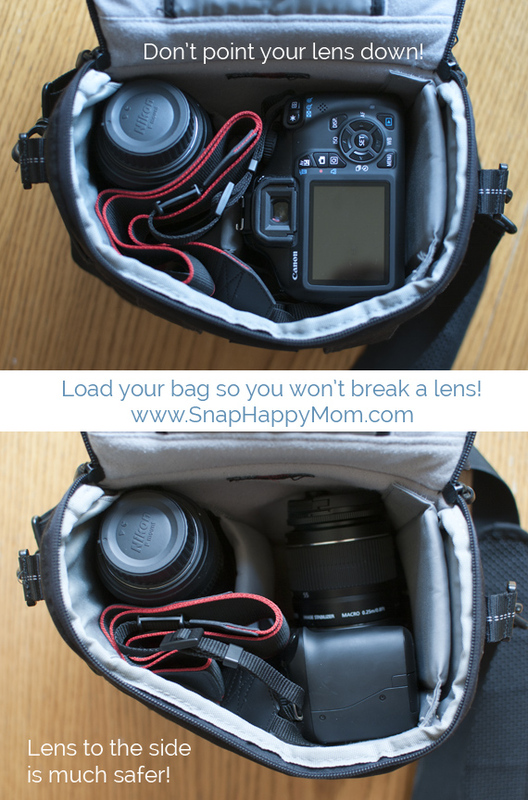 Do not place your camera in the bag with the camera lens pointing down! The reason for this is safety. Lenses are worth far more money than camera bodies, and they are also more delicate because of the glass involved. Breaking a lens is heart-wrenching, but you can reduce the chances of this happening if you are more deliberate with how you put your camera in the bag. 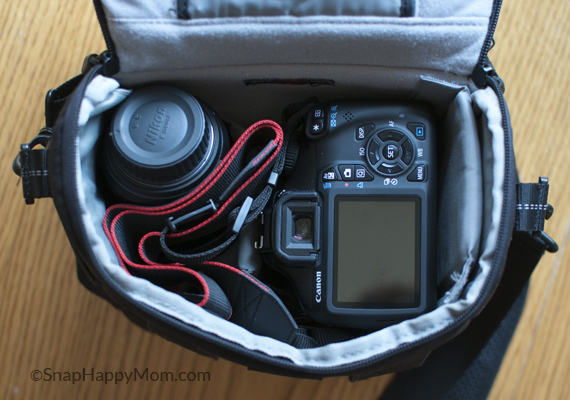 I used to put my camera in my bag this way, and on two different occasions the bag landed on hard ground and shattered my lens filter. The glass was the the closest thing to the impact because it was on the bottom of the bag. It’s not like I throw my equipment around either: both times were simply setting the bag down with a bit more force than necessary. After the second time I wised up and realized I needed to make some changes in my bag layout to protect my gear. I find it is easiest to point my lens to the side or front of the bag, where it’s not bumping into me constantly. This allows me easy access to the right hand grip and means that if the bag hits the ground a little harder, I’m not going to automatically break any glass. Padding pieces can be placed to support and cradle your camera and lens this way. It’s such a simple thing, but has eased my fears significantly. I am extra gentle with my camera bag now, but sometimes it gets set down a bit rougher than I wish, or family members and friends don’t know there is a precious camera inside. I’m happy to announce that I have not shattered any filters or lenses since making this change, almost 3 years ago! This brings me to the importance of adding an extra filter to every lens you have. Without a replaceable filter, I would likely have cracked my actual lens. Filters are cheap and protect the expensive stuff from scratches, dust, fingerprints, and ultimately cracks. They screw on to the end of your lens, and then your lens cap clicks into the filter the same way. If you’re ready to splurge, I’ve heard that this B+H brand is incredible, as well as the Nikon and Canon brand name filters. Also, remember to buy the correct size filter to fit your lens: it’s a measurement in millimeters of the outer edge of your lens, where the cap goes. It will probably be called filter thread, and it will also be labeled on the underside of the lens itself. The kit lenses for Canon are usually 58 mm, and the Nikon are usually 52 mm. Always check before you buy! Filters are essentially disposable- use them until they break, and then replace them. They’ve saved me many times! Nice post. Can you give me the name and model of the bag you have displayed in this post ? If possible link to it will be great! It’s a very old Lowepro bag, and no longer available. It’s appears to be very similar to the Nova 160 AW though, which you can find on the Lowepro site, or here on Amazon. Santa came early (the hubby) and brought me a Canon PowerShot SX50. 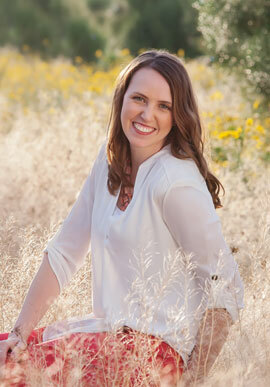 I’m so excited to find your blog and learn how to better use my camera and some photography skills along the way. Nice to “meet” you! So I realize this post was from a long time ago but, I just thought I would point out that the Nikon lens you have to the left in your bag is actually stored lens down.